For the first time ever, large-scale objects have been 3-D printed in a space-like environment. Made In Space just took another step toward its goal of building telescopes and other large structures off Earth. 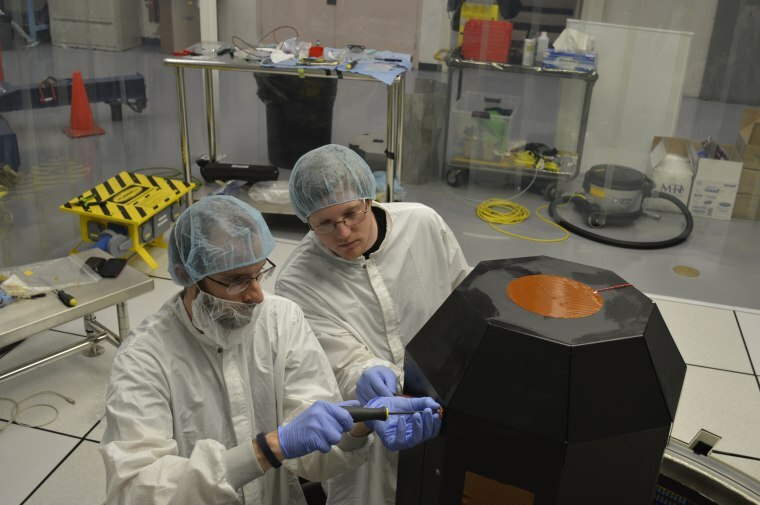 A 3D printer built by the California-based company churned out multiple polymer-alloy objects — the largest of which was a 33.5-inch-long (85 centimeters) beam — during a 24-day test inside a thermal vacuum chamber (TVAC) here in Silicon Valley at NASA's Ames Research Center in June. "This is an important milestone, because it means that we can now adaptively and on demand manufacture things in space," said Made In Space CEO Andrew Rush. "We have significantly de-risked that technology." Made In Space has already demonstrated zero-G printing; the company built the two 3D printers aboard the International Space Station. (NASA owns one of the machines, and Made In Space owns the other, operating it as a commercial facility.) But both of the ISS printers are kept inside the station, so they don't experience the vacuum or extreme temperature fluctuations of space. Such technology will allow for the design and manufacture of much larger and more ambitious spacecraft, since they won't need to fit inside a rocket's nose cone and survive the rigors of launch, NASA officials said. "We do believe that in-space robotic manufacturing and assembly is going to revolutionize the way we design and deploy and operate systems in space," Steve Jurczyk, the head of NASA's Space Technology Mission Directorate, said at Thursday's event. Archinaut "could enable a wide range of in-space manufacturing and assembly capabilities," he added. One such potential capability is the construction of much larger space telescopes. Jurczyk pointed to the example of NASA's much-anticipated $8.8 billion James Webb Space Telescope (JWST), which has a primary mirror 21.3 feet (6.5 meters) wide. JWST will be so compacted for its November 2018 launch that it will take more than 80 separate deployment operations after liftoff to get the scope ready to observe the heavens, Jurczyk said. Such a strategy could work for a space telescope with a mirror up to 26 feet (8 m) or so wide, he added. But NASA wants to build even bigger scopes, ones at least 39 feet (12 m) wide, to hunt for signs of life in exoplanet atmospheres and perform other ambitious observations. "That mission is just not doable right now, given the current launch vehicles and trying to fold things up and fit them in a launch vehicle shroud, in a single launch," Jurczyk told Space.com. "It would take multiple launches of partially assembled systems, which would be expensive." Archinaut would make things much easier and cheaper, he added: Mission managers would just have to launch feedstock material to the three-armed spacecraft, which would build the telescope in orbit. But Archinaut isn't just about building new things: It will also be able to repair and augment existing satellites, Rush said. The next big technological step for Made In Space is working to integrate Archinaut's printer and robotic-arm operations, Rush said. After that step is complete, the company would like to fly a demonstration mission in Earth orbit. Next will come full-on commercial operations. Based on what he's seen, Jurczyk estimated that Archinaut could be up and running by the mid-2020s. "I think operational systems in that time frame are very achievable," he told Space.com.